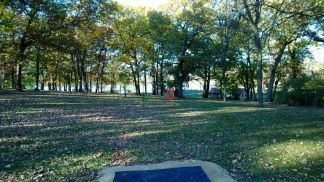 Description: Challenging nine-hole course that features elevation changes, woods, and four holes along or over Allen Creek. Holes 1-8 now have two permanent baskets on each hole, yellow baskets in shorter placement and blue baskets in longer placement. Hole #9 has one green basket on the island. Dual tees on all holes mean there are now 34 combinations of tees-to-baskets playable every day. Local Directions: From Hwy 213/Madison Street, turn east onto Antes Drive to enter park. Follow Antes to the right to reach the parking lot in the center of the park. Hole #1 is next to the bridge over Allen Creek. Cross the bridge to use the short tee.